Bracelet, porcelain / steel memory wire / silver-coated plastic / silver-plated steel, navy blue, 34mm wide spiral, 7-inch adjustable. Sold individually. Item Number: H20-6853JD Have a question about this item? 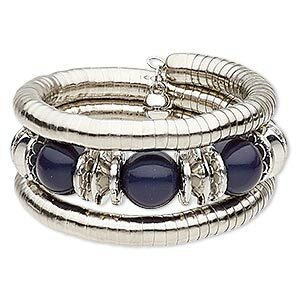 Adjustable three-layer spiral bracelet features navy blue magnesite rounds. Colors, shapes and sizes may vary in each lot. 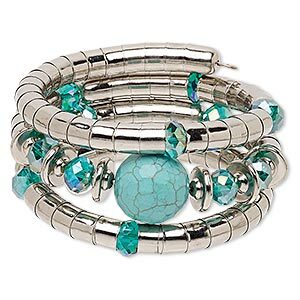 Bracelet, magnesite (dyed / stabilized) / steel memory wire / silver-coated plastic / silver-plated steel, blue, 35mm wide spiral, 7-inch adjustable. Sold individually. 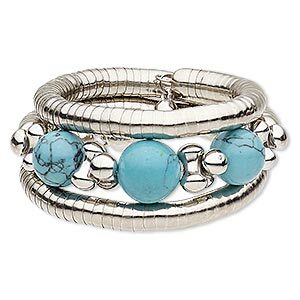 Bracelet, magnesite (dyed / stabilized) / steel memory wire / silver-coated plastic / silver-plated steel, blue, 35mm wide spiral, 7-1/2 inch adjustable. Sold individually. 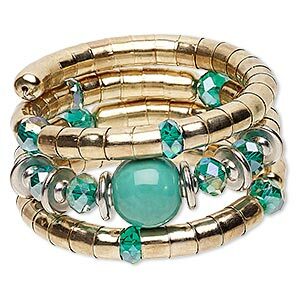 Bracelet, glass / silver-coated plastic / gold-finished steel, turquoise blue AB and turquoise blue, 36mm wide with round, 8-inch adjustable. Sold individually. 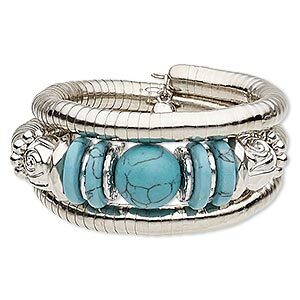 Bracelet, magnesite (dyed / stabilized) / silver-coated plastic / imitation rhodium-plated steel, turquoise blue AB and blue, 37mm wide with round, 7-inch adjustable. Sold individually. 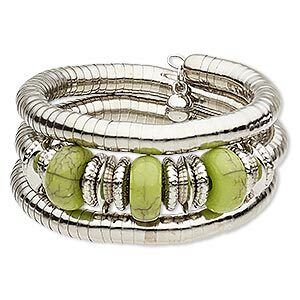 Bracelet, magnesite (dyed / stabilized) / steel memory wire / silver-coated plastic / silver-plated steel, green, 33mm wide spiral, 7-inch adjustable. Sold individually. 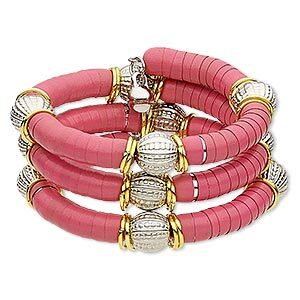 Bracelet, silver-coated plastic / steel memory wire / gold-finished / silver-plated / painted steel, pink, 35mm wide spiral, 7-inch adjustable. Sold individually. 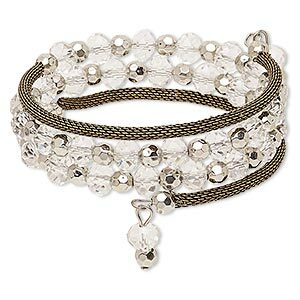 Bracelet, glass / steel memory wire / silver-coated plastic / antique brass-plated steel, clear, 22mm wide with rondelle, 6-1/2 inches. Sold individually. Bracelet, acrylic / silver-coated plastic / silver-finished steel / painted steel memory wire, neon orange, 16mm wide, adjustable from 6-1/2 to 7-1/2. Sold individually. 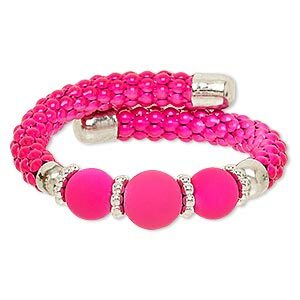 Bracelet, acrylic / silver-coated plastic / silver-finished steel / painted steel memory wire, neon pink, 16mm wide, adjustable from 6-1/2 to 7-1/2 inches. Sold individually. 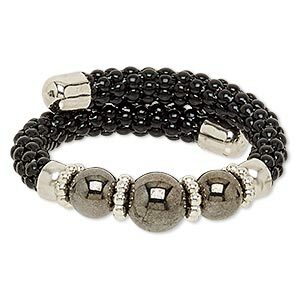 Bracelet, acrylic / silver-coated plastic / silver-plated steel / painted steel memory wire, black, 16mm wide, adjustable. Sold individually.